Keeping Mumbai clean are the conservancy workers doing their jobs diligently. Jewellers selling plastic buckets and steel utensils! In Vakola, a suburb of Mumbai. Guys getting an oil massage at Juhu beach in suburban Mumbai. Make a good pair... checking out whats new ... in Santacruz, a Mumbai suburb. Fresh - The Brihanmumbai Municipal Corporation headquarters building in South Mumbai - after a recent facelift. The Mumbai sky as seen on 22Mar2010 at 6:37pm. A Buddhist temple dedicated to the Japan Buddha Vihara Temple Trust, built and run through the charities of Seth Raja Baldeodas Birla's family. This is in Worli, Mumbai. Jaslok Hospital on Peddar Road (where the rich and famous live) was one of the 1st 5star hospital in Mumbai. Marine Drive in South Mumbai at 7:30am - a popular place for joggers and walkers. This is the business end of the city. The homeless have pitched up their homes on the pavement under the newly built skywalk in Bandra. View from inside a three wheeler - the most popular mode of transport in the Mumbai suburbs. A round cafe with plenty of round fruits hanging, at the Mumbai International airport. Infiniti Mall - A very popular mall in andheri, a suburb of Mumbai. The Bandra Railway Terminus for Western Railway trains plying on interstate routes. The Chhatrapati Shivaji International Airport of Mumbai, arrivals section, in monochrome. Spiral fencing over the wall bordering the Mumbai airport. 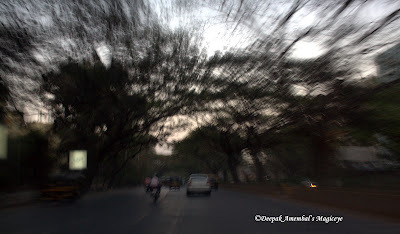 Went over a speed breaker while clicking this :) on the Bandra Kurla Complex Avenue. Passengers relaxing on a makeshift hammock at the Bandra Railway Terminus, Mumbai. Pushing ahead. look closely and you will see that the driver of the autorickshaw is pushing the one ahead with his foot! This is a regular 'assist' feature among the Mumbai autorickshaw drivers. 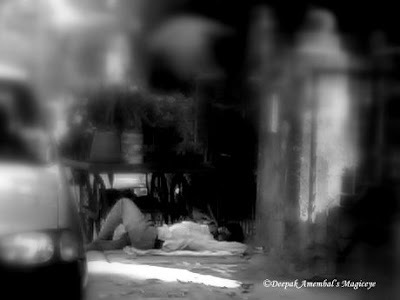 Catching a shuteye in Mumbai! A stray sunbathing at the Bandra Railway Terminus. The arrival gate of the Mumbai International Airport where people arrive from Foreign lands.